Study says the Anthropocene, or Age of Man, began in 1610. An aerial view of icebergs floating by Greenland. 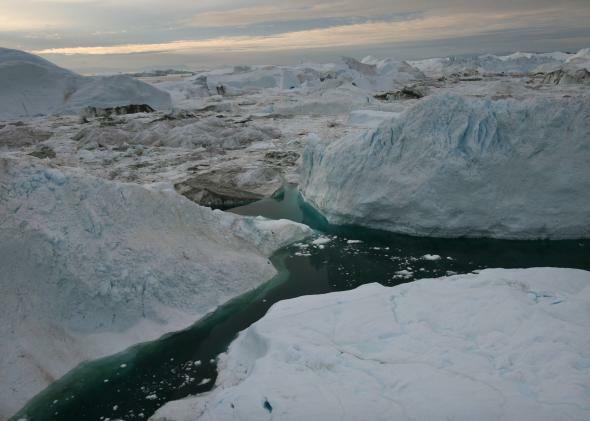 Scientists believe that Greenland, with its melting ice caps and disappearing glaciers, is an accurate thermometer of global warming. The idea that humans are fundamentally and irreversibly impacting the planet is impossible to ignore. But are we a geological force, on par with volcanoes and plate tectonics? A new study published Wednesday in the journal Nature says yes: “Human activity is now global and is the dominant cause of contemporary environmental change.” The paper’s authors also provide a methodology to nail down the exact year when human influence became a driving force in our planet’s permanent record. The authors cite previous research showing evidence that the current era of human activity will likely be observable millions of years in the future. “The Anthropocene” is a term that’s been suggested as a name to describe the “Age of Man.” The Smithsonian’s Museum of Natural History in Washington, D.C., is currently undergoing a massive renovation designed to highlight Earth’s new reality, placing human activity alongside triceratops fossils in a showcase of the planet’s 4.5 billion year history. To formally define a new geological epoch, criteria must be met regarding both hard scientific evidence of profound change and a need for clarification among scientists themselves. An international working group will meet next year to decide if current evidence is sufficient. A formal declaration of the Anthropocene seems increasingly likely: The group’s website references a link to a study describing a new type of rock made from plastic in Hawaii and this Dilbert cartoon as proof the term is catching on. But when did it start? Nailing down the “golden spike” moment that humans began to fundamentally shape the Earth’s geology has been controversial, with most scientists and philosophers pointing to the start of the Industrial Revolution, about 1800. But the new Nature study discounts the Industrial Revolution because there’s no clear marker—fossil fuel uptake came gradually over decades. After systematically analyzing the geologic record for anthropogenic signals that met the working group’s criteria, the new study argues for two specific candidates, one significantly earlier and one significantly later than 1800. The study’s first proposed start date, 1610, is haunting. During the 1500s, the authors argue, the effects of Europeans’ arrival at the Americas spread across the continents. What followed was a pandemic of smallpox, with up to 60 million casualties among the Native Americans—90 percent of the population. By 1610, massive reforestation pulled enough carbon dioxide from the atmosphere to show up in Antarctic ice cores, and perhaps initiate the so-called Little Ice Age cool-down in Europe. The Holocene Epoch, agreed to via a similar process in 2008, describes the rising impact of human civilization since the invention of agriculture. But what’s happening now is a totally different ballgame. Another term that’s gaining favor is “the Great Acceleration” —though unlike “the Anthropocene,” it’s focused on the unprecedented burst of human development post-World War II. The study’s second proposed date, 1964, is also a strong candidate, coincident with a peak in global radioactive fallout from nuclear weapons testing. It’s also around the beginning of “the Great Acceleration.” That’s about when industrial chemicals and plastics also began showing up in the geological record. Since 1964, human-produced carbon dioxide emissions have accelerated along with global temperatures, with man-made climate change now a geologic force of its own. Their proposal of 1610, focusing on that fascinating dip in CO2 connected to the collapse of American indigenous societies, is provocative and compelling. Their other alternative, the bomb-testing signature, is more in line with the views of those seeing the Great Acceleration as humanity’s geological coming of age. I’d give that proposal the highest odds. Revkin says the real importance of whether or not the Anthropocene exists as a formal geological epoch is whether it motivates a change in the way we think about our collective relationship with and impact on the planet. That, he told me, is the “bigger discussion” in the end. The authors also prefer 1610 because selecting it “implies that colonialism, global trade and coal brought about the Anthropocene,” and those factors still heavily influence civilization. In comparison, 1964 is focused more on the increasing power of weapons of war and the international decision to de-escalate that frightening trend. The spike in geological radioactivity exists only because of the Partial Test Ban Treaty in 1963—a moment of success for our species. But whatever start date the committee chooses next year, the Anthropocene will have lasting implications for how we think about ourselves and our power to destroy or restore.